Background: Beneficial effects of dietary proteins and exercise in treatment of obesity is well-recognized. 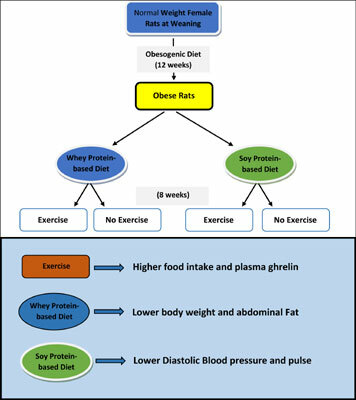 The effect of exercise and protein source on food intake, body weight and characteristics of metabolic syndrome in obese female Wistar rats was examined. Female Wistar rats received an obesogenic diet for 12 weeks. Then, rats were allocated to four groups and received one of the following treatments for eight weeks: 1- Whey protein Diet + Exercise (WPE), 2- Soy protein diet + exercise (SPE), 3- Whey protein diet, no exercise (WPN), 4- Soy protein diet, no exercise (SPN). The exercise comprised of 30 minutes on a treadmill, three times/week. Body weight (BW) and food intake (FI), blood pressure, pulse, glucose and intake regulatory hormones were measured. Results: FI and plasma ghrelin (2.7 times) were higher in exercise groups compared with non-exercise groups. BW was lower (6.7%) in groups fed a whey protein diet compared with those fed a soy protein diet. Abdominal fat (% BW) was lower (22.8%) in WPE compared with other groups. Diastolic blood pressure (11.1%) and pulse (6%) were lower in groups fed a soy protein diet compared with groups fed a whey protein diet. Conclusion: While exercise affects food intake, source of protein determines BW and BC. Whey protein showed more favorable effect on BW and body composition. Blood pressure, body weight, exercise, food intake, metabolic syndrome, protein.